KingCom introduces KingCom VENUS proving that they can also produce a technology with the satisfaction of the consumers in mind while also making it affordable enough for many. KingCom VENUS is a cross between the functionality of a smartphone and a tablet from KingCom who takes pride of being innovative, competitive and cost effective. KingCom VENUS has a cool design finished with the color of champagne gold. With the shape of a candy bar, it has more defined corners while the upper and bottom edges are slightly curved outwards. The elegant phablet gives you just the right style to take with you either at work or just for hanging out with friends. With the height of 184.5mm and width of 106.2mm, this 7 inched displayed tablet-phone only weighs 460grams and could easily be held with one hand. 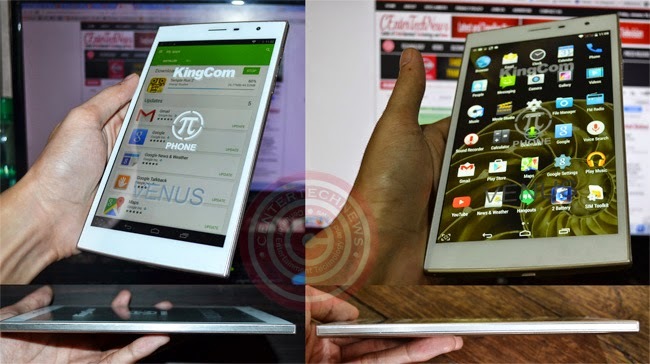 Having the depth of 8.2mm, the slick design could be considered one of the thinnest phablet available in the market. The 3.5 mm stereo headphone minijack is located at the top left of the KingCom VENUS while a small indentation fit for even a short fingernail is located at the right side to easily open the upper back cover. Which houses the micro SD slot, a micro SIM slot and regular SIM slot. A tiny reset button is situated bedside the Micro SD slot and it may need a very thin device to reach the button such as a toothpick. This is to secure that the user won’t reset the phone accidentally. Surprisingly, the buttons for volume and power are all in the upper part of the right edge of the KingCom VENUS and no buttons is found on the left edge. The power, volume up and volume down seemed to be less than one centimeter long each and has little spaces apart. While many are used to phones and tablets with buttons on both sides, this unique design will prevent the user from confusing on which side the power or the volume is located. Also, screen shot with power button and volume down with one hand is such a breeze. The bottom edge is where you can find the Mini USB port for the charger while the microphone is at the far left corner. Just above the screen display are the groove of the phone’s speaker, the light sensor, proximity sensor and the front camera. At the back, the rear camera is at the middle upper part with the flash at its left side. The rear speaker for loud music is at the bottom left just beside its name ‘Venus’. The KingCom VENUS Logo is sitting right at the middle just below KingCom’s name. Don’t let any prescious moment slip the chance to get immortalized. Capture them and some landscapes with the KingCom VENUS wide range rear camera of 5MP. Take selfies and wacky groufies with the 2MP front camera. However, KingCom VENUS only has four different camera modes which can easily be topped by a camera app. Make continuous shots as much as 40 shots and save a panorama like it is a moving motion clip. Feel free to do the peace gesture as it also has auto capture when gesture had been detected. Beat the boredom with the clear sounds of music playback. The speakers are located at the lower left corner at the back engraved beside the phone’s name. Though it lacks the bass, it is enough for music lovers to enjoy 35 hours of non-stop music in full blast. However, if you are particular to high quality of playback sounds during movie watching and music streaming you might need some earphones. While receiving calls, the voice of the person on the other line is loud enough and clear. (Of course this also depends on the network provider). True to their craft, KingCom did not fail to exceed the expectations on the battery performance of their KingCom Venus. It has built-in rechargeable lithium-ion battery of 3000 mAh. The battery is non-removable and the back cover that won’t budge secures it. It can continuously play music for 35 hours. Since the unit we tested is new (we only tested one unit), the initial charging took 6 hours from 0% battery to 100% juice up. If connected with WiFi while playing games such as Subway Surfers and Temple Run 2, the battery took up to around 8 hours before its juice was drained to 4 percent. The battery duration test during idle hours is still in progress. 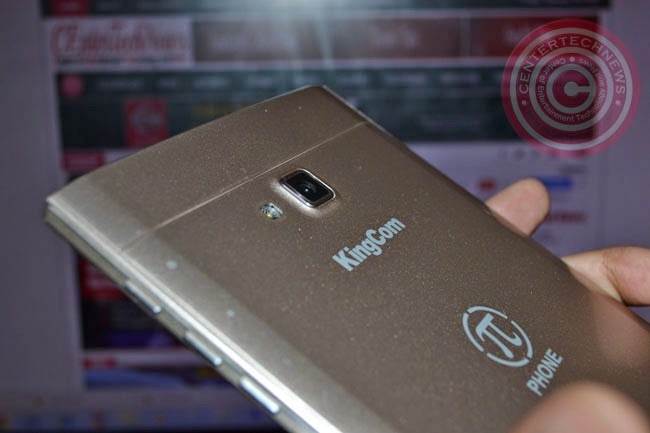 The 7” displayed KingCom VENUS takes pride with FullHD IPS (In-Plane Switching). This means it has quality display which is very detailed showing the same vivid colors no matter in which angle you look from, even if it is right under your nose. 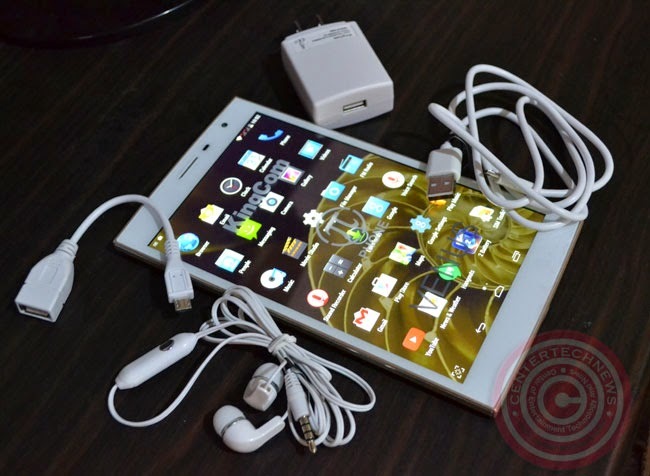 Powered by Octa-core MTK 6592 with CPU speed of 1.7 GHz, KingCom VENUS runs with Android Kitkat 4.4. 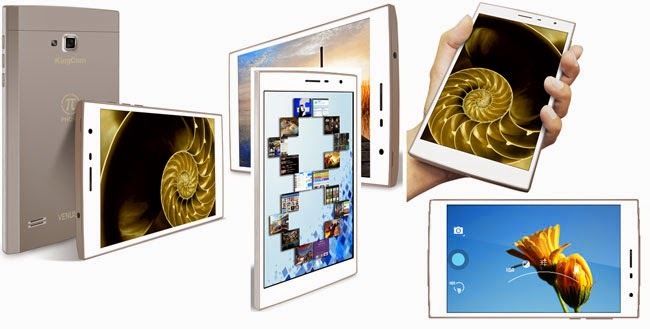 Since KingCom works hard to maintain the convenience of their consumers, KingCom VENUS is also a Dual SIM tablet handset. If you are unwilling to have your old SIM card cut into Micro SIM yet also unwilling to change your contact number, you need not to worry since it has a slot for a regular sized SIM card and another one for Micro SIM card. It has 2G RAM while its ROM is a staggering 16G. It’s external memory can be expanded with Micro SD card as much as 32G. KingCom VENUS is one of the fastest phablet competing in the market, armed with an octa-core processor and undeniable large memory capacity. As KingCom proudly presents KingCom VENUS as a phone and a tablet, it won’t get behind when it comes to connectivity. Connect to the internet with 3G, HSDPA, 7.2Mbps, HSUPA, 5.76Mbps and Wi-Fi 802.11 a/b/g/n, DLNA, WAPI hardware encryption. Share videos, music and other files through Bluetooth 4.0 wireless technology. Save or move files with USB through OTG (On The Go). 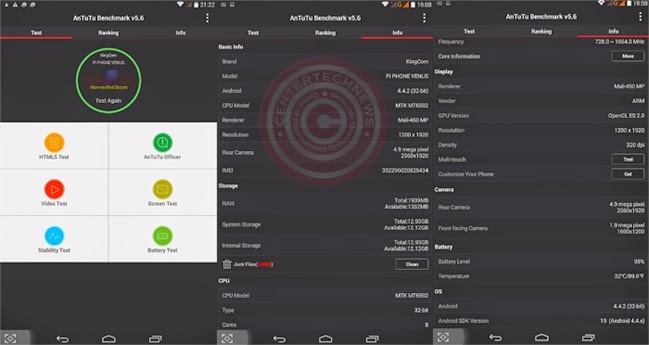 AnTuTu Benchmark is an Android Benchmarking App that is very comprehensive and useful especially when you are looking for a new phone and has no idea where to begin. This app looks into the phone’s CPU Integer Performance, RAM test, CPU Pointing Point Performance, Memory Performance, SD card read-write speed, and Database Input and output (I/O). Each item is assessed and given a score then it ranks your device among other Android devices. According to AnTuTu Benchmark, KingCom VENUS has a score of 38,108. Such score put KingCom VENUS on the 9th spot in the global AnTuTu Benchmark ranking, ahead of many other known recent devices. The rear camera of 5MP can shoot wide angles. Metal framing is visible, it gives a more secure feel with the touch. While you can screen grab by simultaneously pressing the power button and volume down button, you can just easily tap the screen grab icon found at the lower left corner of the screen. You can now take a photo together with a friend on Skype while making gestures with your other hand. Most of the devices could rotate the screen either to the left or to the right, KingCom VENUS can even rotate the screen upside down. The design is elegant enough with gold finish making it presentable during a formal gathering or cool enough during hang outs. Battery life is 3000 mAh which is far better than most handsets in the market. Finally, it is fast as expected with its system. However, SIM cards would not be detected once they are inserted. The user must restart the device after inserting the SIM cards. Many worry about non-removable batteries due to fear of handset lagging, if ever such case happens, the user can easily reset it by pressing the small reset button at the back. 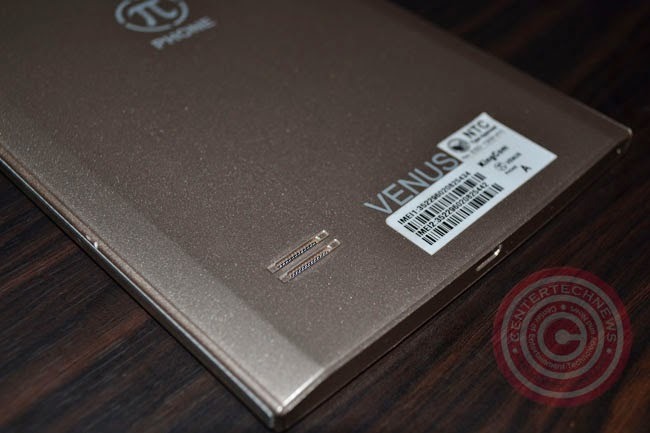 With the price of P7,998, KingCom VENUS is competitive enough among its contenders in the market. While it is only currently available in Lazada, KingCom VENUS will hit the KingCom stores and its dealer’s kiosks on February 2, 2015. You can check it in KingCom official site.